Pubs looking to cut their use of disposable plastics, such as straws, cups and cling film, have a fresh repository of advice to draw on with the launch of ‘Unwrapping Plastics: Use and Misuse in Hospitality’ manual from the Sustainable Restaurant Association (SRA). 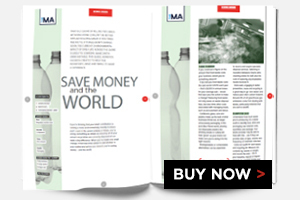 The advice examines alternatives for the most widely used plastic items, such as bottles, straws, coffee cups, takeaway packaging, cutlery and cling film, to help foodservice businesses work out the most sustainable option for them. It looks at different materials from production through to disposal and offers clear information about what will actually be recycled, for example, as opposed to things that just have the potential to be recycled. Want to reduce single use plastic waste? Start here. He said that many foodservice businesses have already taken the first step, which is “acknowledging they have a plastic problem”. He recognised that a number of businesses have already moved to end the use of single use straws and stirrers, with many pubs leading the way backed by the pub industry campaign #TheLastStraw​. SRA aims to help pubs and other hospitality businesses ask the right questions when dealing with suppliers and waste service providers. Working with SRA, top chef Skye Gyngell of Spring restaurant said when they realised that they had used enough cling film to stretch from their central London location to Istanbul (3,600km) since opening they were inspired to look for alternatives. However, after some investigation they realised they didn’t actually need to use film at all and have now stopped using it.